Who doesn't love something that comes piping hot out of the oven, is wrapped in dough, and filled with a savory, flavorful filling? The answer is no one, because once you wrap anything in dough and bake it, it will be enjoyed no matter what. I am going to use the word empanada loosely with these recipes because these are not authentic empanadas. I decided to go with some different flavors and try out two different kinds of store-bought dough. I filled pie dough and pizza dough with a Mexican inspired chicken filling and a spicy beef mixture. Both of the fillings were awesome. Easily something to make on their own and serve with rice as well. As far as the better dough, it is a tough call. I prefer the pizza dough as it is not as heavy and I like the chewiness. The pie dough is amazing, but not for a whole meal as it is really rich. 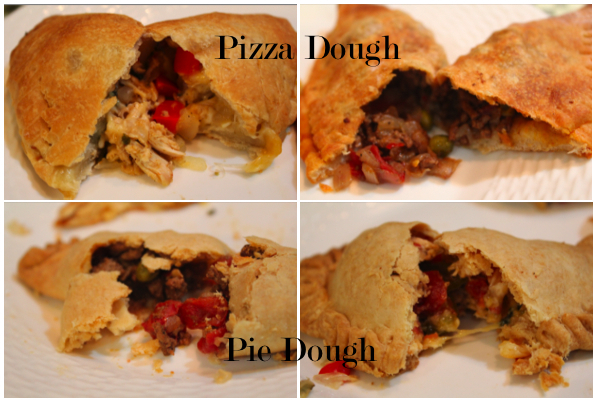 Pizza dough is better for dinner sized empanadas and pie dough is better for small appetizers. Both were great and easy to make. This is a great way to use up some leftovers as well. Just pack them in the dough with other delicious ingredients you have around and enjoy. To make: Add the oil to a skillet over medium heat. Add in the onion, bell pepper, and jalapeno and cook until softened. Add in the garlic and cook for 1 minute. Add in the chicken, tomatoes, salt, pepper, and cumin. Cook for 5 minutes until well combined. Remove from heat, add in the cilantro. Set aside to cool. To make: Add the oil to a skillet over medium heat. Add in the onion and cook until softened. Add in the garlic and cook for 1 minute. Add in the beef, salt, pepper and spices. Cook until meat is cooked through, about 5 minutes. Add in the wine and cook for 5 minutes until mostly evaporated. Add the tomatoes, and cook another 5 minutes. Add the thyme and peas, cook until the peas are no longer frozen, about 2 minutes. Set aside to cool. You can make the empanadas whatever size you would like. For both the pie and the pizza dough, you handle the same, but the pie dough is much less pliable. So be careful. Sprinkle some flour on a big work surface, place the dough on it and sprinkle it with flour as well. Using a guide, like a glass, cut out circles in the dough. Place some filling in the very center of the circle, not too much. Fold the dough over itself to create half a circle and at least a 1/4 inch rim. Fold the edges up, pinch the edge with a fork all around to secure. Brush with the egg wash and place on the baking sheet. Cook for 20-30 minutes depending on the size. They are done once browned and edges are cooked through. Note: Assembly took some time to get used to. They were not that pretty, but they tasted great!